A warm fire awaits you at The Cabin at Mountain Glen! Enjoy a quiet getaway after a day or weekend exploring wineries, shops and restaurants along the Shawnee Wine Trail! This season is perfect to enjoy area wineries and local shops along with great indoor and outdoor events, music and festivals such as Carbondale Rocks, Vulturefest and The Southern Illinois Irish Festival! Enjoy tastings, music and friends at the wineries, a gourmet dinner at The Brickhouse Grill, traditional Swedish dinner at Hedmans or BBQ at Great Boars of Fire! Food and music at The Old Feed Store or Von Jakob, The Makanda Boardwalk and Anthill Gallery or Village Art and Gifts in Cobden have great artisan and junk shops to browse! Or just kick back at Starview or Orlandini's! End your day with a starlight soak in the hot tub with a glass of local award winning wine or enjoy the company of friends roasting marshmallows fireside at our outdoor shelter. 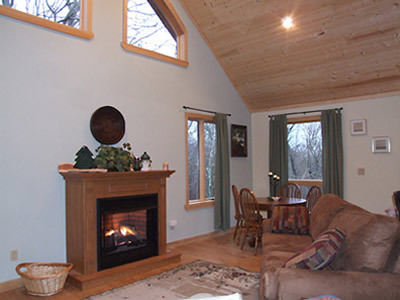 Beauty and Comfort await you at The Cabin at Mountain Glen! Enjoy an weekday, weekend or long term stay at our luxury 2 bedroom cabin in the heart of Southern Illinois Wine Trail country! A romantic getaway for two, a family adventure or a weekend with the gang awaits you at The Cabin at Mountain Glen! Ray and Rose Hogan invite you to visit Southern Illinois’ most luxurious cabin nestled on 60 acres of pristine woods, pasture and prairie. The Cabin boasts a vaulted great room with fireplace, full kitchen, a luxurious main floor master bedroom and bath with a custom 2 person shower and Jacuzzi tub. 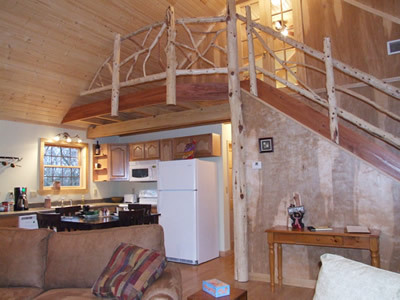 The huge second floor lofted bedroom and 1/2 bath overlooks 20 acres of pasture and wildlife. The full kitchen and laundry provide all the comforts of home. Relax in the rocking chairs on the 8 x 40 front porch, or enjoy a cozy fire in the adjoining covered shelter with stone fireplace! 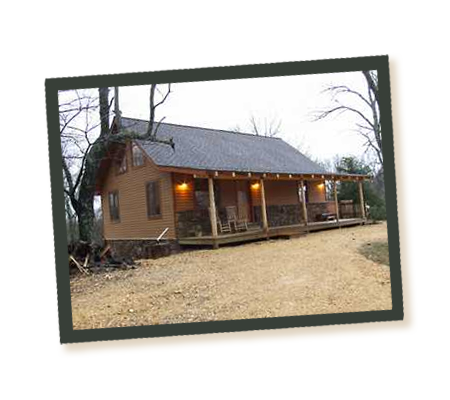 The Cabin is located in the heart of the Shawnee Wine Trail. 6 wineries are within 8 miles and the Cabin provides a great base to explore the best that Southern Illinois has to offer! Hunting, fishing, hiking, biking and canoeing are minutes from your door! Just a 1/2 hour drive to Carbondale and the SIU Campus, The Cabin at Mountain Glen is the perfect getaway spot!